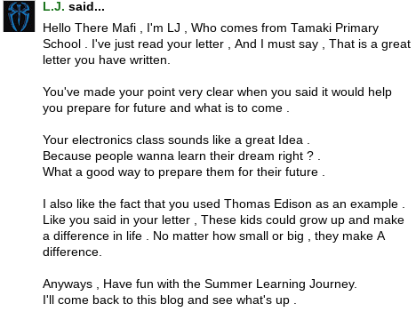 Today's Blog Comment goes to Mafi , From Glen Innes School . Here I am , Making another blog comment and sending it to someone outside of my school who is part of another school and is participating in the Summer Learning Journey . I've finished my journey , But I continue to visit the work of others who have not finished .